When a day overwhelms its borders, you end up exhausted in your bed but unable to sleep. The eyes long to close, but your mind wants to use the remaining hours of darkness to bring closure to the fullness of emotion. It is fullness that is keeping my weary body awake. It´s past midnight and yet I am eager to continue feeling the joy, solemnity, and newness of what happened today. The truth is I don´t want to let go of the beauty of this moment; I don´t want it to end. The accumulated scenes and sounds of this day were too much for 24 hours. I may just need a lifetime to truly appreciate the events framed within one sunrise and one sunset. The apex of August 24, 2013, was being present at the baptism of a young person who I love as a sister. 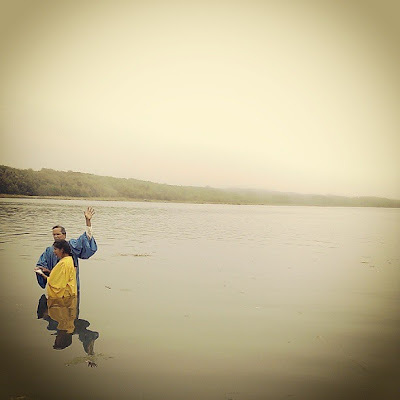 My immediate family, our close circle of young adult brothers and sisters, and our extended church family watched as my dad immersed her in cold waters. We knew that it was the power of the living God that had brought us to this river´s edge. Songs rose. Knees bent under the gray sky. She had chosen to be God´s and He had chosen her. Heaven came down and touched every cheek with ocean mist. I felt like shouting jubilantly, smiling recklessly, and letting tears flow. All expressions seemed appropriate, but all I could manage were a couple happy words and reflective smiles. I sensed that just as our friend was symbolically walking into newness, we would likewise never be the same because of how our hearts were mutually bound together with hers in Christ. An invisible seal of eternity settled around us. Unfeigned love and recognition of God´s sacrifice continued to thrill us—taking a stroll in the fresh air and later on participating in a sacred concert and sharing time. I shut the piano lid and stepped out of the side door of the church. I almost didn´t want to head over to the center where we were going to serve refreshments. I was too full already.